A few summers ago, two of our dearest friends got married. We hosted a few pre- and post-wedding gatherings, and many other impromptu dinners on the deck. My idea of a great summer. I’m not much of a pastry chef (okay, I’m not anything close to a real chef, pastry or otherwise). My go-to dessert all that summer was lemon-almond biscotti served with Nutella and homemade strawberry-orange granita*. 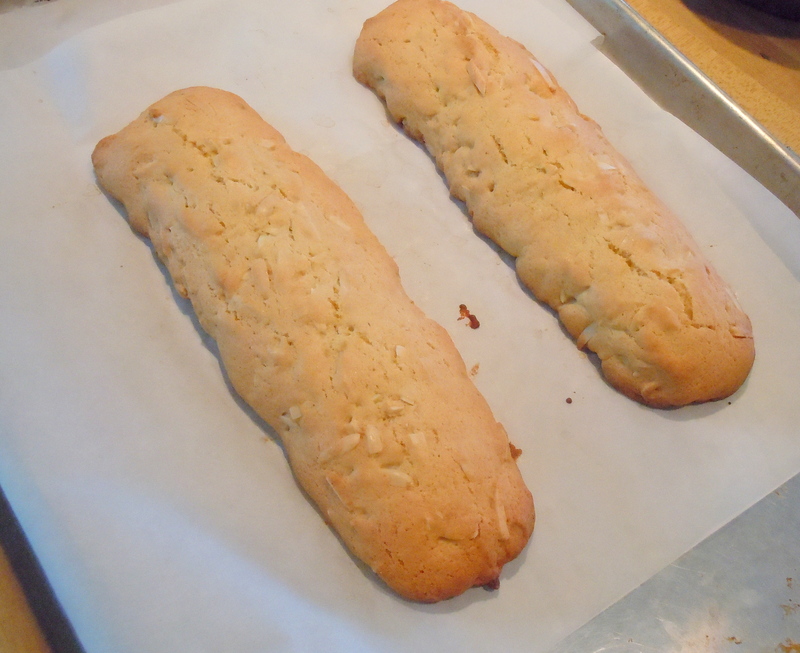 These biscotti are not overly sweet, and are also, remarkably, not hard enough to break a tooth. The leftovers (when there are any) make a great light breakfast with some good coffee or tea. 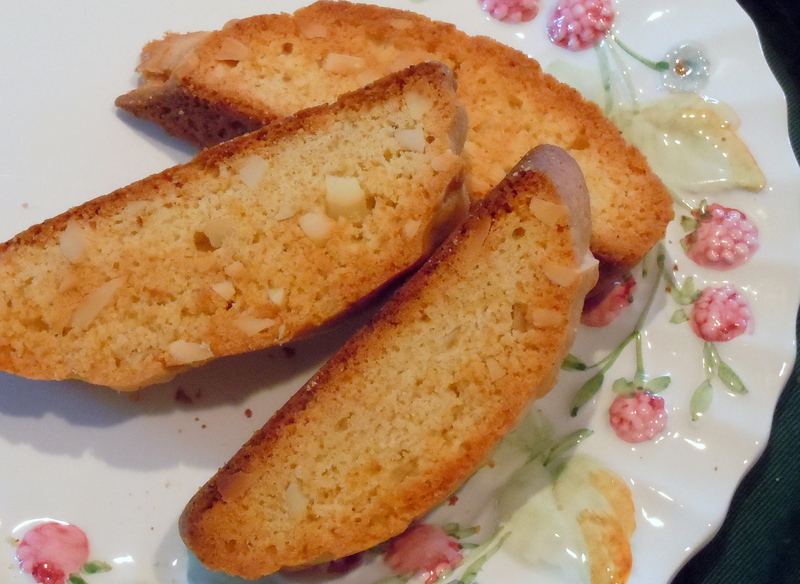 This is my version of Giada di Laurentiis’ Holiday Biscotti. I boosted the lemon zest, used almonds instead of pistachios, and left out the fruit. I would make these with most any nut, and I do sometimes add dried cherries, but I am fond of the clean simplicity of lemon and almonds. Blanched slivered almonds are especially pretty in these cookies, but any version will do in a pinch. “Biscotti” means “twice-cooked.” The biscotti are cooked first in long logs, then sliced into individual cookies and baked again. I prefer to keep the second baking to a minimum, so the cookies are crisp but not rock-hard. They’ll still hold up when dipped into a cup of coffee, but dipping is not a requirement. If we’re feeling decadent, we’ll paint one side of each cookie with some melted chocolate. And as I said before, there’s always Nutella. Stir together the flour, baking powder, and salt in a small bowl. In a larger bowl, beat the sugar and butter until they’re light and fluffy, 3 to 5 minutes. Beat in the eggs one at a time, then the zest. Beat in the flour just until it’s incorporated; don’t overmix. Stir in the almonds. Bake for 30 to 40 minutes, until the logs are just cooked through but not hard, and are pale gold on top. Cool the logs for 20 to 30 minutes (leave the oven set at 350°F). Move the logs to a cookie sheet, and save the parchment-covered cookie sheet. Cut the logs diagonally into slices about ¾-inch thick; a serrated knife and a gentle touch work best. Lay the slices flat on the cookie sheet and bake for 10 to 12 minutes longer, until the slices are golden. This entry was posted in baked goods, sweet stuff and tagged almond, biscotti, cookie, dessert, lemon. Bookmark the permalink. making them now. the dough smells YUMMY! if we want to put on chocolate, at what point do you think we should do so? Hey there! If you’re spreading them with melted chocolate, do it when the cookies are completely cool. You can add a tiny dab of butter or Crisco to the chocolate as it melts, to make it glossy, but it’s not necessary. If you’re talking about spreading them with Nutella, you’re free to grab the jar as soon as the cookies are cool enough not to burn the skin off your fingers. they are fantastically delicious, and we are extra pleased that they are dippable but not teeth-shattering. yay! going to be a staple for us now. Glad you like them. I think I’m going to try them with orange zest and pecans today, since we have a boatload of oranges in the house right now.